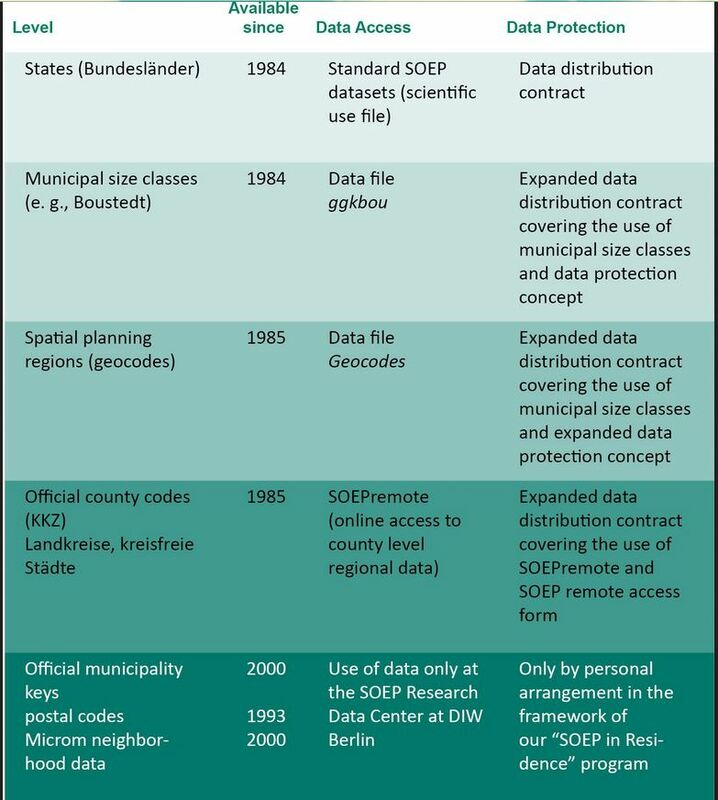 SOEP offers diverse possibilities for regional and spatial analysis. With the anonymized regional information on the residences of SOEP respondents (households and individuals), it is possible to link numerous regional indicators on the levels of the states (Bundesländer), spatial planning regions, districts, and postal codes with the SOEP data on these households. However, specific security provisions must be observed due to the sensitivity of the data under data protection law. Accordingly, you are not allowed to make statements on, e.g., place of residence or administrative district in your analyses, but the data does provide valuable background information. For your research project you want to measure current (year 2016) urban-rural differences in the population. You are particularly interested in the differences in political interest and the different satisfaction variables provided by the SOEP. You also want to take into account demographic differences in gender and age. In order to be able to evaluate the research potential, you should get an overview. For regional analyses, for example, the community size classes from the regional data are suitable. a) Prepare a cross-sectional analysis data set covering the survey year 2016 (wave bg). Never Changing Person ID "persnr"
Current Wave Household Number "bghhnr"
Satisfaction With Household Income "bgp0105"
Satisfaction With Personal Income "bgp0106"
Satisfaction With Amount Of Leisure Time "bgp0108"
Satisfaction With Child Care "bgp0109"
Satisfaction With Family Life "bgp0110"
Satisfaction With Social Life "bgp0111"
Spatial category by BBSR "bgregtyp"
Use the various important variables of the ppath.dta data set as your start file. Keep people who completed a questionnaire in 2016 and live in a private household. Recode negative values into missings. Categorize the community class sizes of the SOEP regional data set. lab var ggk_cat "Community Size categorised"
lab var alter_cat "age categorized"
lab def alter_cat 1 "<=20" 2 "21-30" 3 "31-65" 4 ">65"
lab var bgbula_cat "Federal states categorized"
7 "Baden-Wuerttenberg" 8 "Bavaria" 9 "Berlin" 10 "Saxony" 11 "Saxony-Anhalt" 12 "Thuringia"
Put the variables in your preferred order and save your data set. b) You want to get an initial overview of regional differences in satisfaction with various aspects in Germany. Use the variable bgsampreg and cross-stabilize the variable with all satisfaction variables to identify differences between East and West Germany, display the absolute and relative frequencies. To save the tables, save them in a log file. To view all tables, look at your generated log file. c) Now take a closer look at satisfaction with various aspects of life with the help of SOEP regional data. Use the community size classes. Create a table showing you satisfaction with different aspects of life and revealing differences by gender, age, community size class and federal state. To view all tables, look at your generated log file. As you can see, SOEP regional data can be used to analyze variables at the smallest regional levels. It becomes clear that the SOEP offers a wide range of possibilities for region-related analyses. It is possible to allocate a multitude of regional indicators at the level of the federal states, the regional planning regions, the districts and the postal codes.